Chad Ryan | The Journal Gazette Michael Phelps, winner of 23 Olympic gold medals in swimming, speaks Tuesday night at Parkview Field. 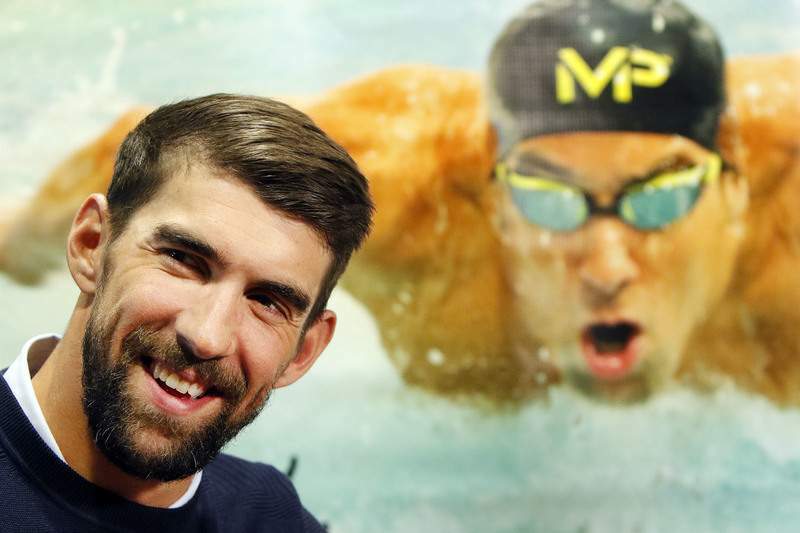 Phelps was at the annual training event for Master Spas, which has been affiliated with the most decorated Olympian since 2010. Olympic-champion swimmer Michael Phelps made quite an entrance at Parkview Field on Tuesday while in the Summit City to talk with dealers during Master Spas’ annual training event. Phelps and his coach Bob Bowman arrived at the event in a helicopter and landed in center field. "For me, I’ve been able to build a family away from home here," Phelps said about coming to Fort Wayne. "We’ve been working with Master Spas for seven years now and being able to share the same passion is something really special. For me, especially, loving the water and loving the sport of swimming so much to be able to keep improving." The partnership between the 23-time Olympic gold medalist and Master Spas started in 2010. Phelps met with company executives and discussed future plans for the company’s products and toured the facilities. "(Tuesday) was really, really awesome for me to spend time with them behind closed doors, just us, where we were able to look around the factory and have candid conversations and just talk about what we wanted to do and what we could do in the future," Phelps said. "They’re just people sharing the same exact passion as me. We can help people throughout the world, and we’re doing it one step at a time." In his retirement from the sport, Phelps is shifting his focus to charity work and building his family with his wife, Nicole, and son, Boomer. "Ever since the (Rio Olympic) games, we’ve been traveling in and out of the country, just doing a few things here and there," Phelps said. "My biggest thing is starting the next chapter with my family and building a family with my wife and our first child, Boomer, and continuing to help more people as I can to become water safe. "That’s the only reason I was ever put in the sport. My mom wanted us to be water safe. I think there are way too many drownings all over the world and in the U.S., especially children, and that’s something that needs to change and needs to change now." The fact that Phelps and Bowman are able to continue their relationship away from the pool is something they value as well. "Bob and I have a great relationship and it’s gotten better and better throughout our history," Phelps said. "If I don’t go to the pool at all, I see him three or four days a week. "He comes over and hangs out with Booms most of the time. Bob’s been a part of my family since day one, so I think that bond will just grow more and more. "I think it’s cool to be able to look at the relationship and the history that we’ve had. If you look at most sports, you won’t find an athlete and coach that have a career that spans over 20 years. I’ve literally only been coached by him, and that’s it. It’s kind of cool and really special for me to continue to grow."